For our Robo-Advisor Review, we assessed, rated, and ranked ten different firms. Instead of relying on website information and marketing materials as most editorials do, we opened and funded an account with each robo-advisor to acquire a true client experience. Please Note: StockBrokers.com does NOT earn a referral commission if you open an account with one of the below firms. This is part of our mission of helping Americans receive financial advice they can trust. A robo-advisor is a digital-first, algorithmic driven investment advisor. While a formal advisory service uses humans to construct a diversified portfolio and provide financial advice, a robo-advisor relies on technology, algorithms, and academic portfolio theory to build and maintain a diversified portfolio. Both traditional advisors and robo-advisors are regulated by FINRA and are required to file quarterly SEC disclosures. This guide will introduce investors to robo-advisors and their current role in the investment world. If you have at least $50,000 to invest, no one provides lower costs than Vanguard. While tools are essentially non-existent, Vanguard Personal Advisor Services (VPAS) plans are built by humans and include full access to a human advisors on demand. With over $150 Billion under management, which is more than all other robo-advisors combined, VPAS provides investors the best value. 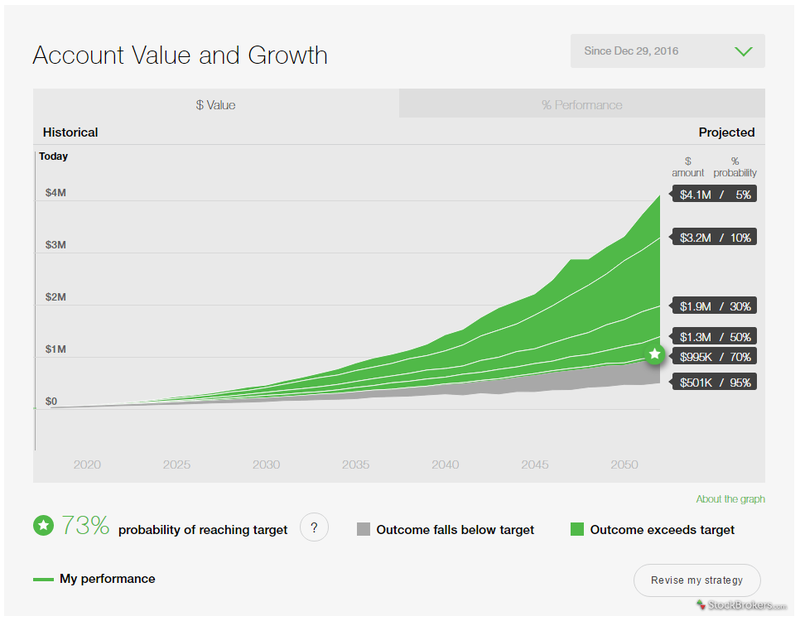 Betterment provides great all-round value for investors seeking low-cost, automated retirement guidance. The optional upgrade to Certified Financial Planners (CFPs) on demand offers clients great added value. 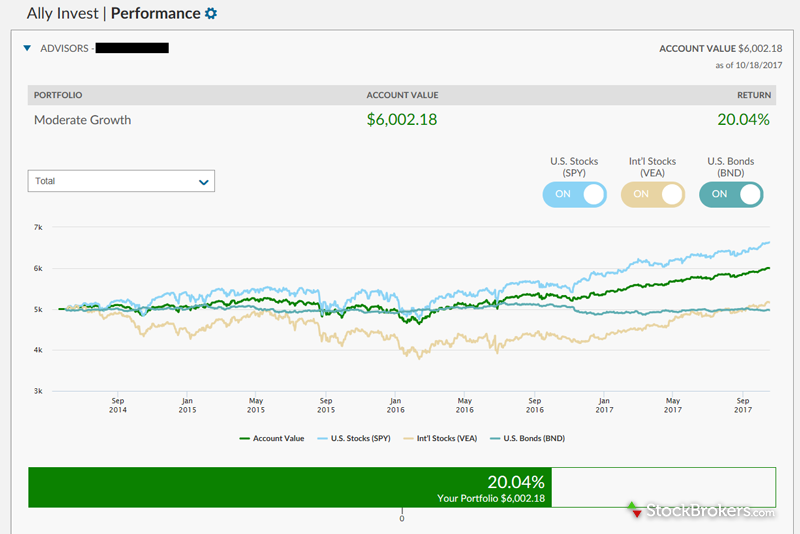 Schwab Intelligent Portfolios is a winning combination of crazy low-cost (no annual management fee), quality market reports, and clean goal tracking. That is, as long as you are ok with a high cash allocation potentially affecting performance. Schwab Intelligent Portfolios account dashboard. For $1 a month, individuals can invest spare change into their own investment account and join a community of passionate Americans saving for life’s most important goals. 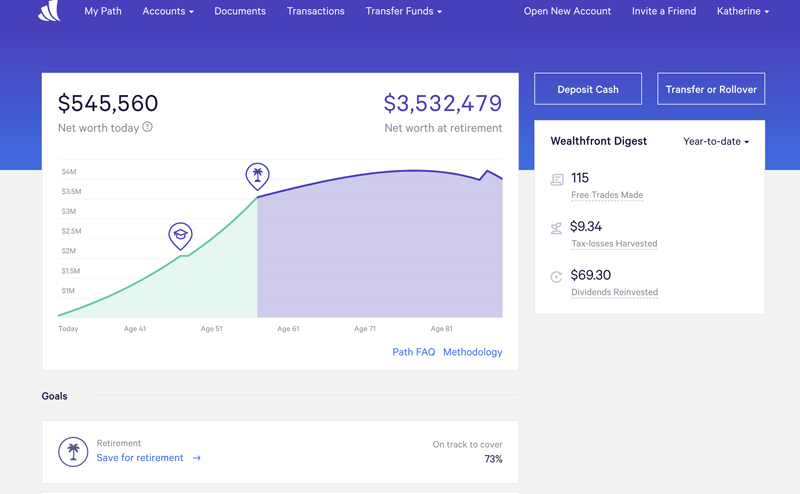 Thanks to its Path tool and low costs, Wealthfront shines, providing clients an excellent robo-advisor experience, regardless of the device used. 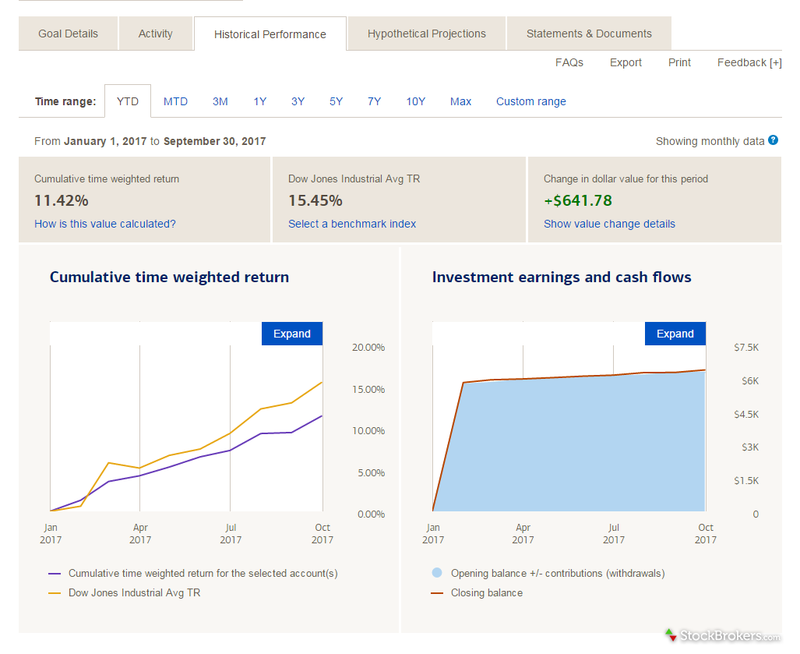 TD Ameritrade Essential Portfolios offers clients the complete package – tools, low cost, and investment wisdom powered by Morningstar – to build and manage automated investment portfolios. TD Ameritrade Essential Portfolios goal summary. 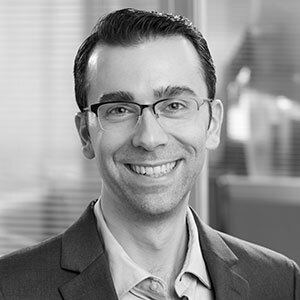 Fidelity Go, Fidelity’s robo-advisor service, is a good solution for current Fidelity brokerage clients; however, the service lacks the depth of tools to compete with industry leaders. 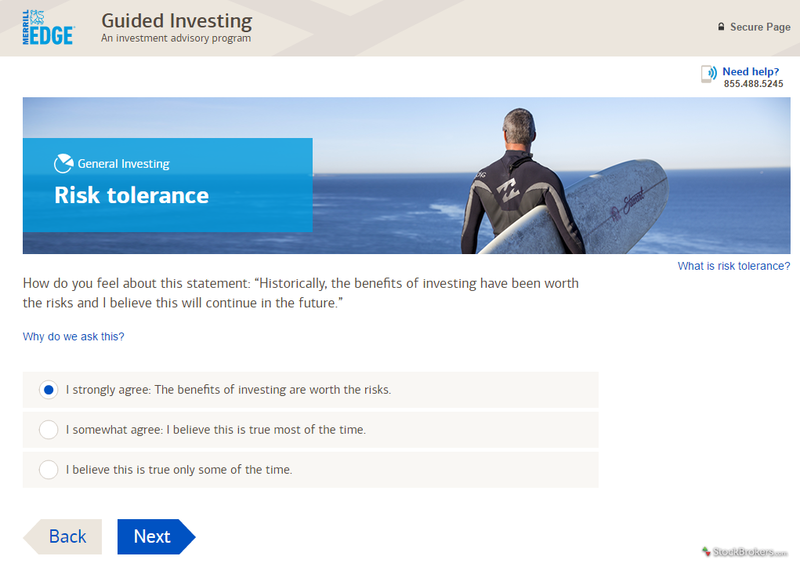 Ally Invest Advisors offers a decent goal-tracking foundation through its LIVE platform; however, a poor approach to portfolio selection and lack of advanced tools is disappointing. Ally Invest Managed Portfolios portfolio summary. Due to its higher cost and lack of tools, Merrill Edge Guided Investing is a viable option solely for current Bank of America and Merrill Edge customers, thanks to its convenience. Merrill Edge Guided Investing portfolio analysis. E*TRADE Core Portfolios provides a bare-bones experience, with no goal tracker, that trails far behind category leaders. By removing the human component and using low-cost index exchange-traded funds (ETFs), investors can cut their annual fees by over half. The average investment advisor in the US charges an annual management fee of around 1% (of total portfolio assets), whereas robo-advisors charge around 0.30%. Thanks to the power of compounded returns, these annual savings, which remain invested in the portfolio, turn into significantly higher returns for the investor. Robo-advisors create investor confidence by providing a variety of tools to facilitate goal setting and long-term portfolio management. Talk to a Certified Financial Planner (CFP), and he or she will be quick to note that building a diversified portfolio is not the challenge; instead, it is navigating your mind. Human psychology is complex, and we are all subject to a slew of investor biases; for example, selling during a market downturn instead of staying the course, which can have dire consequences for our financial future. If you are currently disciplined in managing your personal finances, keeping a consistent budget, and have a fundamental understanding that over time the stock market will rise and fall, then a robo-advisor may be a good fit. You will be able to fully appreciate the retirement and goal-planning tools provided to you, which will enhance your financial prowess. On the contrary, if you are uncomfortable with the stock market and periods of financial uncertainty, such as bear markets, then a robo-advisor may not be an appropriate choice for you. While goal-planning tools and risk-tolerance questionnaires help encourage staying on course, you ultimately have control of the reins. You can log in at any time and change your risk tolerance, which in turn will shift your portfolio holdings. Worse yet, worrying about your portfolio could cause you to close the account altogether. Fortunately for all investors, the robo-advisor space is evolving at a fast pace. Competition has yielded a variety of new entrants in the past year, each with their take on goal planning on portfolio construction. Furthermore, nearly all robo-advisors follow a fiduciary standard and several robo-advisors have launched or are in the process of launching, optional upgrades to access low-cost human advice. To sign up with a robo-advisor, first, you fill out your investor profile (age, income, goals), then complete a risk-tolerance questionnaire. Our research found the average questionnaire incorporates two or three questions. The data you submit is compiled to determine a “risk score” that establishes a recommended portfolio. Portfolios fall within three primary buckets based on your risk score: conservative, moderate, and aggressive. If everything looks good, you then complete an application, open the account, and deposit funds. 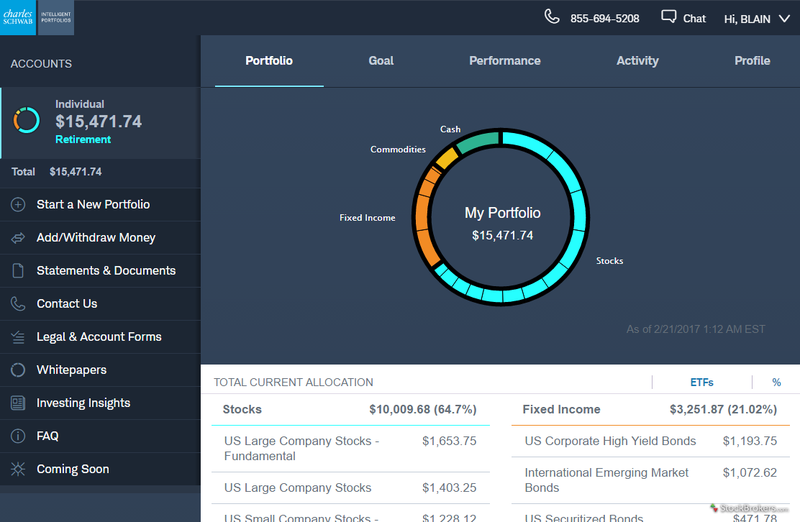 Once your account is up and running, you can use a variety of tools to monitor your portfolio and track the progress of your goals over time. While robo-advisors can track goals such as saving for a house or vacation, they are overwhelming used for long-term life goals such as saving for retirement.